Do you treat idiopathic toe walking? For over ten years, we have been using this design in the vast majority of the cases we see. For the right patient, this design works exceptionally well to establish a normal heel-toe gait pattern. 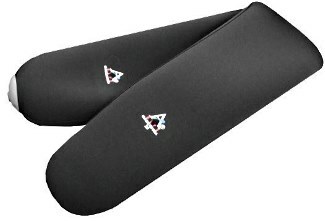 We have found that physical therapists prefer this design as it is less invasive and lower profile than hinged AFOs. Our fabrication facility is centrally located in San Antonio, Texas. Mention this ad for 25% off your first order. Call or visit our website for more information. Our vision is to restore hand functionality to people with partial digit amputations. 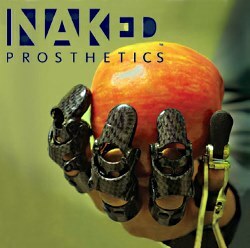 By taking advantage of a newly matured manufacturing process, and through innovative design, Naked Prosthetics is becoming a leading provider of cutting-edge custom finger prostheses. These one-of-a-kind devices articulate freely and progressively with the residual finger, providing an option for people who need a finger prosthesis that can improve object manipulation, grip strength, and dexterity. The MCPDriver is a functional finger prosthesis designed for people with amputations at the proximal phalanx. The PIPDriver is for amputation levels at the middle phalanx. The Triple Action™ Stance/Swing Control Ankle Joint is designed to provide highly adjustable control of the lower limb during both the stance and swing phases of gait. The patent-pending component excels in the treatment of complex neuromuscular disorders. Alignment, plantarflexion resist, and dorsiflexion resist are independently adjustable, which help to simplify optimization. The component delivers high resistance, permitting mobilization of the ankle through both the stance and swing phases of gait. From early rehab to full recovery, go anywhere! From rehab, to the home and the office, to the gym and the trail, RHEO KNEE® XC confidently goes anywhere, whatever the weather. In fact, in a controlled clinical trial, RHEO KNEE XC enabled users to walk farther, faster, and with less fatigue. RHEO KNEE XC supports advanced capabilities like cycling, leg-over-leg stair ascent, and running. Learn more at www.ossur.com/rheoknee-xc. Orthomerica's Fuzion product line was developed to enhance your orthotic options by introducing the element of compression therapy to orthotic bracing. The original Fuzion design incorporated compression therapy for AFOs. 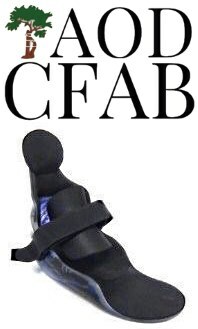 With the development of the Fuzion Orthotic System, we offer multiple options for utilizing compression therapy. 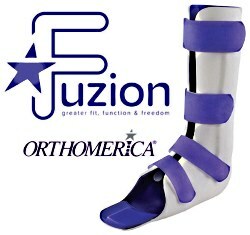 AFOs, KAFOs, KOs, SMOs, EOs, WHOs, EWHOs, TLSOs, and LSOs are all part of the Fuzion Orthotic System. Who is a good candidate for a Fuzion product? Patients who typically have challenges with standard plastic orthotic braces due to spasticity or bony prominences. The MAGLOCK eases the frustration of donning a pin lock liner for patients who have transtibial or transfemoral amputations and K1-K3 activity levels. 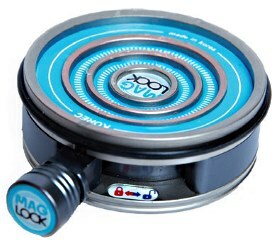 The MAGLOCK is developed to deliver up to 90 lb. of force. The large distal target allows the patient to be 10 degrees off center and still achieve suspension. The ultimate product for people who have dexterity issues, have pin alignment issues, or require a caregiver, and much more. No wires, no battery. The College Park C100 cylindrical shuttle lock is made from high-strength, durable nylon and used as a traditional lock system for lower-limb prosthesis users. Retrofittable with similar shuttle locks, the C100 is lightweight and provides a secure fit, and the push pin can easily be cut to the appropriate length for the prosthesis. 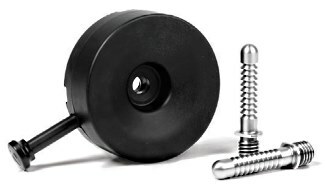 The C100 lock is rated to 300 lb., has a two-year warranty, and comes with two plunger pins with five different lengths, from extra short to extra long. Order online at www.college-park.com/shuttle-lock-c100. Visit our new website to read the ToeOFF story and learn why Allard continues to be the world leader in carbon fiber AFOs. Did you know all Allard AFOs are autoclave-cured, which is necessary for producing AFOs with less than 0.25% void content? Minimal void content is essential for carbon fiber AFOs to provide superior performance and durability. Don't accept inferior substitutes. Allard USA has been successfully alleviating foot drop since 1997. Contact us or visit www.AllardAFO.com to learn about all 40 reasons Allard is the world leader in carbon fiber AFOs. Introducing the RUSH ROGUE™! Everything you love about the existing RUSH™ Foot Collection, featuring even more comfort, improved performance, and +/- 8° of torsion. 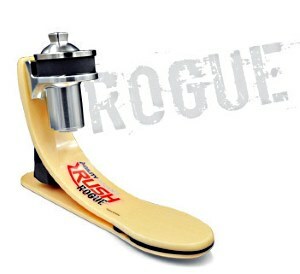 The ROGUE provides the most realistic and dynamic foot and ankle motion available. 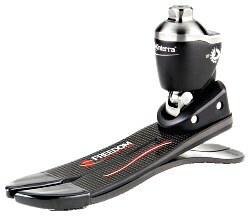 The vertical loading pylon provides comfortable relief from high-impact loading, allowing the user to push the foot to the limits. The roll-through characteristics of the foot provide exceptional energy return with no dead spot. What are you waiting for? Go ROGUE. Go RUSH. To learn more visit www.rushfoot.com. ALPS' new AP Tapered Liner is gradually tapered from the anterior to the posterior to provide superior comfort. This liner is available in a pin and lock system or suction suspension. The AP Tapered Liner features our black, high-performance fabric with gel to assist in reducing bunching in the popliteal region. The Infinite TF and Infinite TT by LIM Innovations® are the first custom-molded, modular, and dynamic prosthetic socket systems that offer adjustability at each component in response to volume and shape changes of the residual limb. The Infinite Socket product line offers a holistic improvement in patient comfort, and freedom through its unique, dynamic design. Contact us for more information.